Our fully centrally heated 17C farmhouse has been completely refurbished and stylishly decorated and is perfect for luxury family holidays. Three large bedrooms plus a fourth children’s TV room with a double sofa bed provides comfortable sleeping accommodation for everyone. 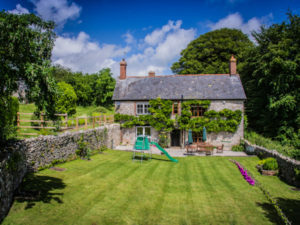 Situated alongside the beautiful woods of Monkton Wyld but within three miles of both Lyme Regis and Charmouth, you are never short of things to do. Local villages retain their individuality with meandering streets and great country pubs tucked away down country lanes. The large kitchen leads through to a traditional dining room with wood burning stove. Sitting room, with a second wood burner, and French doors leading onto the large south facing enclosed lawn – safe for children to play – with terrace and garden furniture; a great space for enjoying long summer evenings.